The movie is about a circus and in particular its freak show, but until the final moments of the film, we never see anyone actually perform. The cast is divided into freaks and non-freaks (and I use those terms, which I realize may be offensive to some, only because they are the language of the film: the entire story takes place in the freak show amongst people who earn their living as freaks): the former grouping includes microcephalics (or so-called pinheads), an androgyne, a bearded lady, armless women, a limbless man, several little people (including Hans and Frieda, who are engaged to be married at the start of the movie), and a pair of Siamese twins. The non-freaks include Cleopatra, the trapeze artist (with whom Hans is in love, in spite of his engagement to Frieda); the strong man Hercules (with whom Cleopatra is in love); and a clown (Phroso) and his girlfriend (Venus). All of the characters reside in their own furnished caravans, and most of the action takes place either in the caravans or just outside of them. The story revolves primarily around Hans and Frieda. Frieda knows that Hans really loves Cleopatra, and she is right to suspect him as Hans affectionately gives money and jewelry to Cleopatra, who is merely toying with his affections so as to marry him and secure his rumored fortune for her and for her lover Hercules. Cleopatra succeeds in marrying Hans, and at the wedding reception she, with the help of Hercules, begins to poison Hans. When the freaks offer her a sip from their common cup at the banquet (the song they sing at this moment, “We accept her, we accept her. One of us, one of us. Gooba-gobble, gooba-gobble” has often been quoted in popular culture), Cleopatra overturns the cup, screaming that they are freaks. She continues to poison Hans at home in his wagon, but Hans is wise to her plot, and on a stormy night when the circus is moving to another town, he and the other freaks assemble to enact their revenge. One of the rich ambiguities of the movie in the end is the question of who the true freaks are. On the one hand, there are the members of the actual freak show, many of whom are outwardly disfigured, but then there are the two completely conventional-looking characters who behave so cruelly and maniacally (and, we should note, so differently from two of the other non-freaks, Phroso the clown and Venus) that they would seem to be good candidates for inward freakishness. But the movie does not rest content in having raised that compelling point. The freaks go even further—daringly, perhaps unnecessarily—to make Cleopatra and Hercules into outward freaks as well. I find their vengeful project especially interesting as the film makes no case for any of the freaks having been made what they are through any process other than genetics; when they revenge themselves on the two conventional characters and render them freaks, they are in essence enacting a process on Cleopatra and Hercules that they have not experienced—they were born freaks, not made into them, and so they are doing something new in assigning freakishness as a punishment for crimes. There are further complexities. At least two substantive versions of this movie’s ending exist. One aspect of the original cut (which no longer exists) that is decidedly more disturbing is the fate of the strong man Hercules, who in the original is castrated for his part in Hans’s poisoning and made to sing a horrible duet in the circus (his part high-pitched) with the also mutilated Cleopatra. In the final cut, both the castration and the duet were cut. In the original version, what happens to Cleopatra was also deemed too horrifying for wide release. The original cut showed her fleeing into the forest at the end, pursued by the freaks and pausing near a tree. Lightning strikes, causing the tree to crash down on her midsection. Her legs, perhaps destroyed, are immobile. The freaks surround her, and then the camera cuts back to the circus tent, where Cleopatra appears transformed into a saggy-faced, legless torso wearing a feathered duck costume, issuing a horrifying and dehumanized quack from a straw-filled pen. In this original version, at least part of the blame for Cleopatra’s disfigurement seems to rest on nature in the form of the lightning and fallen tree, not on the freaks. In the final version, which was edited so as to diminish some of the extreme criticism that the first screenings generated, what happens precisely to trapeze artist Cleopatra is more ambiguous. Pursued by the freaks, she runs into the wood, but our final glimpse of her in that scene is of her screaming near the tree, while another shot shows us the vengeful mob. The lightning does not strike, the tree does not fall, and it is not clear what happens to her, other than that later at the circus she is revealed as the duck woman. But how much of what we see in the final version are the freaks responsible for? Because the film cuts away from them in the forest and no natural forces are at work, it would seem that, unlike in the original, they are responsible for most of what happens to her. It is not clear which ending is the more horrifying. To focus so much on the movie’s ending perhaps implies that the ending is what primarily got the film into trouble (although Browning had achieved considerable success with the Bela Lugosi version of Dracula in 1931, his career ended shortly after the release of Freaks), but this would be an oversimplification. The film was banned in Great Britain for thirty years, not on the basis of its ending, but rather because it was perceived to be exploitative. 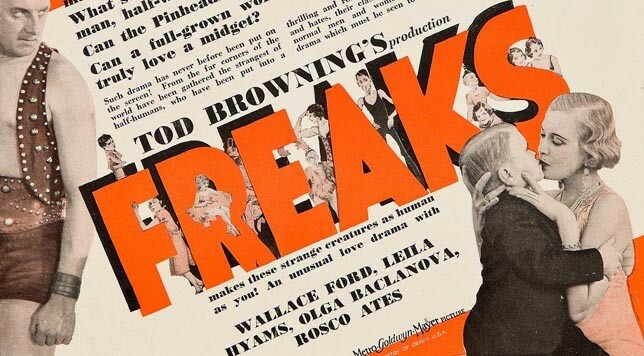 Freaks focuses on a detestable trade: the display of disfigured people for profit and shock value. Again, however, I must point out that the film does not present its disfigured protagonists performing; if it did, we might well be tempted to say that the film participated in their exploitation along with the fictional circus audience that viewed them. Instead, Freaks treats us entirely to dramas backstage, and most of those dramas manage to present the performers in a sympathetic light. Perhaps one of the reasons that their revenge is so difficult to watch and process is because the freaks are figures of such benevolence and complexity elsewhere in the picture, driven by basic human wants and needs and capable of feeling profound hurt and sorrow. Ultimately, Freaks is a revenge drama, and like all revenge drama, it can be difficult to stomach and accept, in part for the vigilante mentality its characters embrace (and are not punished for embracing), placing the responsibility to mete out justice in the hands of those who are wronged rather than in the hands of the law or divinity. But as such, it draws on a long line of revenge drama predecessors that do much the same thing, including many Renaissance examples such as Hamlet and reaching all the way to our present day with such recent movies as Tarantino’s Inglourious Basterds. Tarantino’s film is a good example of what a black comedy that is revenge-driven can be like. It differs from Freaks in that whereas the characters of Inglourious Basterds are revenging themselves against an entire political group (the Nazis) that is either directly or conceptually responsible for their suffering or the suffering of others who are like them—and from their standpoint, the more they kill, the better—the avenging characters of Freaks exact their revenge on the precise individuals who are responsible for causing Hans to suffer and for insulting them at the wedding banquet. Perhaps we might think that the extremely personal and specific nature of the freaks’ revenge might make what they do more palatable, but ironically, for me anyway, compared to Inglourious Basterds, Freaks is the more unsettling movie.